I was born in Loxton, South Australia, in 1964 making me 33 years old. I am married to Denise and have two little girls, Cindi, aged 6 and Amber aged 4. I have wanted to be a signwriter as long as I can remember, even at primary school I can recall watching our local writer and his sons after school, as their sign shop was on my way home. I used to call in quite often and just watch in awe like you do, e specially when they started airbrushing. I was just amazed. I think I would have only been about 7 years old and from that time on I used to just draw and draw. Right through my school years, I would really put all my effort into drawing and painting (and not much effort in the other subjects) :) and this ended up being my strength. After being told that they didn't need me anymore at school, I got a job picking fruit, then in a fruit packing factory and also was a welder in a concrete pipe manufacturing factory. During all this time, I n ever forgot my dream of signwriting and continued to practice my drawing and painting as a hobby. My parents owned a garage and employed both my brothers. (I also have a sister who is deceased) One brother raced speedway cars, so I ended up doing his sign work. I have also raced scramble bikes & 500cc speedway bikes since I was about 10 years old, until I stopped racing speedway in 1987. During this time it gave me the opportunity to get a lot of race cars, bikes etc to sign, whi ch was a great way for me to learn and jobs snowballed from there. I actually still get jobs from people who remember me from my speedway days! From the age of about fifteen I think, I tried to get a job at any of the sign shops around my area but to no avail, and even tried to do a correspondent course but they wrote back saying I was too young. I did license plates and small signs for a while for friends and by word of mouth, using each job to try new things. I use to just paint any old thing from glass, old corrugated bits of tin, paper, did pictures on all my bedroom walls (several times) an d even a Aussie flag over my whole bedroom ceiling , just anything to practice on. I would take any challenge (and still do). 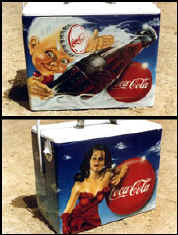 At the age of seventeen my job as a welder was about to finish as the factory had to shut down, so this is when I took a big step and decided to become a signwriter as it was still my passion. I think I brought a couple brushes, some paint a shiny stick thing with a rubber ball at one end and borrowed a old ladder, hey presto.. instant signwriter. I live in small country town with a population of just over 7,000 so work really started off slow which was good as I have never done any trade school or training. I am totally self taught in everything I have done from basic lettering to custom signs, airbrush work and murals, gold leaf both loose and transfer,sand blasting, pinstriping and truck scrolls, advertising on grass at football grounds and golf greens (signwriting onto the lawn), scr een printing, foam letters and all the other general signage work we get to do and even this computer thing. I brought my first computer a Gerber 4B in 1989 and thought it was just the coolest thing, as I had the first and only (sign) computer in our area. Having pushed it beyond its limits and while we were living in Perth ( in 1993, and were heading back home) we decided to buy a completely new state of the art computer package. A PC with Sign Wizard software, flat bed scann er, colour printer and friction feed plotter. WOW ! Now this was cool! We again had something nobody else had in the area, so we had so much more to offer now plus the speed we could turn things over now was great. Of course now every man and his dog has a sign system. We use the computer a lot, but we tend to use it for layouts, cut stencils and a combination of paint and vinyl in almost every sign we do. I still don't like the look of totally computer cut signs although you have to for those safety signs etc. Hey! I have and still do try to put a bit of artwork and airbrushing into as many signs as I can. It's probably a bit of my trademark. This is done for a couple of reasons. One...it keeps us interested in what we are doing. 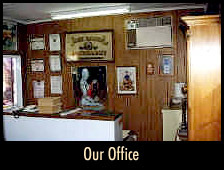 We love to do custom work, but also make it look traditional wherever possible. Even if it is mainly vinyl, we try to make it look hand done and more pleasing to the eye. In addition, it also makes a boring sign look good. 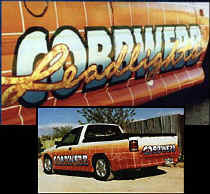 I have now been signwriting for sixteen years and over those years have employed only three writers the last was Darren Wenzel, who I got to run my business in 1993 while my pregnant wife and our fifteen month daughter traveled across the otherside of the nation to Perth , Western Australia to live and work. While there, we had another beautiful daughter and I ended up working for four different sign shops which was really good for me. I have never worked for any sign shops before and was curious to see if I was good enough, and also for the experience which was great, I learned a great deal from these other shops. After about a year we decided to return home to Loxton, and continue on where we left off with the exception of keeping on Darren. Darren and I work really good together and are both into doing really nice work for our customers and enjoy doing custom airbrushed work and murals etc. 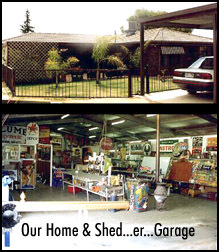 We have both attended the last three out of the four Australian Letterhead Meets and next year the meet is here at my workshop in Loxton, South Australia in September 1998. Watch The Letterhead Website for a special page on the event! Things sure have changed over the years from the tiny little room in my parents shed that you couldn't swing a cat in, to my own workshop in the town (formally my dads garage) until I built a house and workshop on just under a quarter acre and now work from home. This is both good and bad. My workshop is 30ft. x 80ft, with a 30ft x 30ft lean to on the side. Its great living and working here (being a country boy), rather than the hustle and bustle of the big smoke. Life here is really relaxed, the work is busy and we get a lot of cool stuff to do. 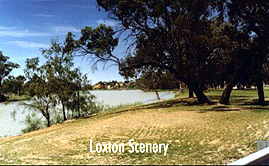 Loxton is in a cluster of small towns all on the River Murray (the largest river in Australia) and all about the same population within minutes of each other.The furthest abou t an hour away. Loxton is almost on the Victorian border to the east and Adelaide (the States Capital) is a two and a half hours drive to the west. Most of my work is from within a 100 kilometer radius but also do work where ever it takes us, as we do work all over the state and sometimes Interstate. 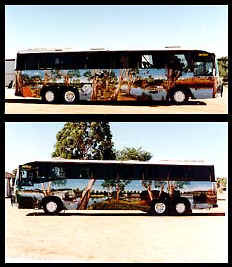 Some of our work goes as far as Darwin, at the top of Oz, Brisbane , Sydney and Perth (all capital cities of Australia). 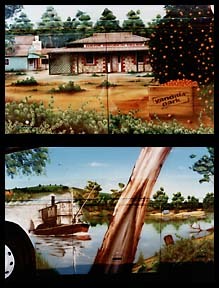 We have also traveled as far as Sydney to do a large mural. That's a 12 hour drive one way! Some of my other interests are water skiing, motorbikes and my 1928 A model ford coupe hot rod, and of course "The Net". I was married in 1991 and traveled to Hawaii and California for our honeymoon which was GREAT. Over the years, I have traveled all over Australia seen a lot of great signs and met heaps of great signwriters whose mateship I treasure. Since I fired the computer up to the internet and joined in on the Letterheads Chat, I have met a lot of great guys and gals, some of which I have only been able to admire through magazines like SignCraft and Airbrush Action. Hope I haven't bored you with my life story and thanks to Steve & Barb Shortreed for the opportunity! Hope to catch ya on the #Letterheads chat channel.